Note: Truman is a dry campus. We do not allow any alcohol beverage containers (empty or full) in the residence hall rooms. Remember that space is limited, and that any University furniture that is in your room when you arrive must stay in your room. Storing residence hall furniture outside of its original room is prohibited. Pets except for fish or small amphibians as long as they are nonpoisonous and live in a tank that is less than 30 gallons. Air conditioners are not permitted unless the student presents a new prescriptive letter every academic year from a medical family practice physician or allergist (M.D. or D.O.) by Aug. 1. Download our Residence Life Booklet (PDF) which is packed with helpful information for new students. Have questions about Residence Life or On-Campus Housing? See Rules for Residence Life or visit the Residence Life website. 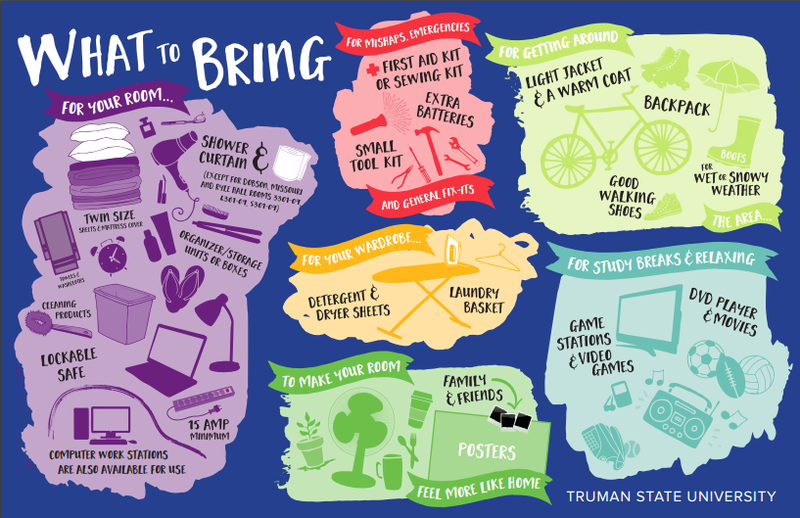 Contact the Residence Life Office at (660) 785-4227 or reslife@truman.edu.